A comprehensive ontology can ease the discovery, maintenance and popularization of knowledge in many domains. As a means to enhance existing ontologies, attribute extraction has attracted tremendous research attentions. However, most existing attribute extraction techniques focus on exploring a single type of sources, such as structured (e.g., relational databases), semi-structured (e.g., Extensible Markup Language (XML)) or unstructured sources (e.g., Web texts, images), which leads to the poor coverage of knowledge bases (KBs). 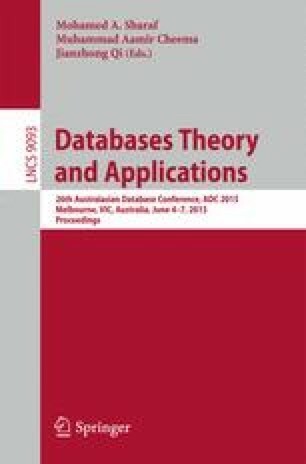 This paper presents a framework for ontology augmentation by extracting attributes from four types of sources, namely existing knowledge bases (KBs), query stream, Web texts, and Document Object Model (DOM) trees. In particular, we use query stream and two major KBs, DBpedia and Freebase, to seed the attribute extraction from Web texts and DOM trees. We specially focus on exploring the extraction technique from DOM trees, which is rarely studied in previous works. Algorithms and a series of filters are developed. Experiments show the capability of our approach in augmenting existing KB ontology.